Legendary MMA promotion Pancrase kicks off 25th anniversary year with this Sunday, February 4 (late Saturday night in the US) with 13-fight card headlined by a must-see flyweight title fight. Pancrase 293 is headlined by boxer turned King of Pancrase Senzo Ikeda taking on 22-year-old knockout artist Yuya Wakamatsu. The event is live on UFC FIGHT PASS. Ikeda defends his title for the first time after taking the Flyweight King of Pancrase belt from Japanese MMA icon Mamoru Yamaguchi at Pancrase 289 last year. The newly-minted champion, 11-6 in MMA, has a tough assignment against No.1 contender Wakamatsu, 9-1 (8KOs). The challenger has a lot of buzz about him in his native Japan, and hasn’t lost since his pro debut, aged 18, four years ago. Ikeda, 35, had a successful boxing career before switching to MMA in 2011. His punching power and strong takedown defence have been too much for many of the top names on the Japanese circuit and, after defeating Yamaguchi, has promised a long reign as the King of Pancrase. But much is expected of Wakamatsu. He challenges for one of MMA’s most traditional titles with a lot of momentum behind him. The young striker is trained by Ryo Chonan – who defeated Anderson Silva and Carlos Newton in his own MMA career – and has finished half of his opponents in the first round. In the co-main event of Pancrase 293, powerful lightweight Akira Okada, 12-5-3 takes on Brazilian veteran Ricardo Tirloni, 20-6, in a No.1 contender match-up. Akira has fought some of the best in the division and is coming off a win over Japanese icon Akihiro Gono. Now trained by the legendary Takanori Gomi, Akira has promised a dominating performance to guarantee a shot against the ferocious lightweight King of Pancrase, Takasuke Kume. Tirloni is riding a five-fight win streak, and making his Pancrase debut against the top ranker in the division is his chance to make his mark in the Land of the Rising Sun. The 34-year-old Brazilian has fought the likes of Jadison Costa, Pat Healy, and Rich Clementi, and only five of his 23 victories needed the judges’ decision, with the remaining 18 wins by KO or submission. A dangerous all-rounder, Tirloni has good hands, kicks, knees, and dangerous choke submissions. In the Women’s Strawweight division, upcoming prospects Ayaka Miura and Korean’s Yedam Seo, go head to head…. Flyweight prospect Toru Ogawa clashes with Shohei Masumizu with the winner moving up into the top 5… heavy handed, iron-chinned Hiroyuki Testuka collides with Brazilian UFC veteran Glaico Franca, with the winner due to face Takashi Sato for the now vacant Welterweight King of Pancrase title…. 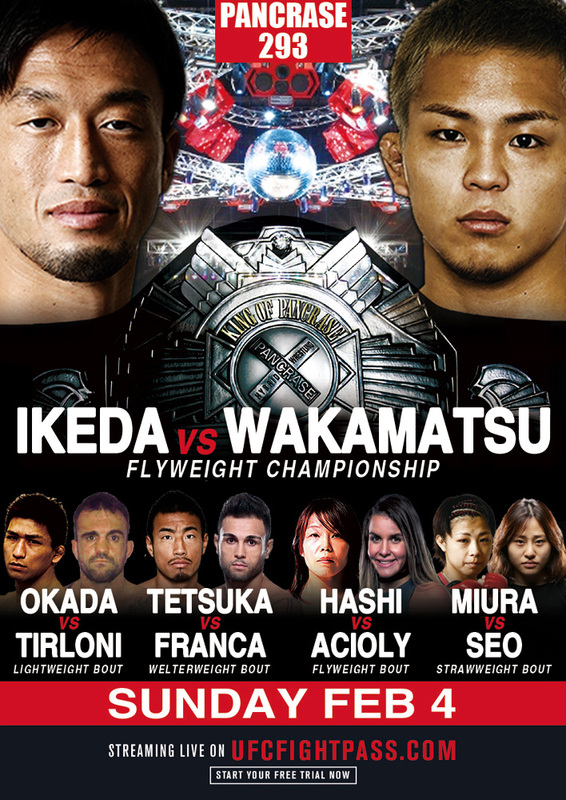 Takayo Hashi takes on current Invicta fighter Barbara Acioly… flyweight: Ismael Bonfin vs Suguru Nii. PANCRASE 293 is live on UFC FIGHT PASS, beginning 12:30am on Sunday.